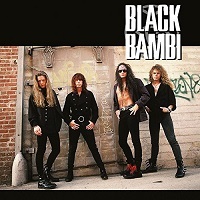 BLACK BAMBI get a release of their 1990 album through 20th Century Music. The album was in fact shelved by Atlantic back in the day. Once touted as a future big-league possibility, the LA based band opened for the likes of BADLANDS and BLACK CROWES. Rewind back to 1990 and Rock was changing just before Grunge. Hair Metal had its late 80’s heyday or “hairday” and fans wanted a bit more down to earth image and more of a retro bluesy sound. Enter GUNS N ROSES, BLACK CROWES, BADLANDS et al. BLACK BAMBI were in this era. Still a bit glammy but less dumbed down than Hair Metal. The band delivered too along with the likes of JUNKYARD who did get a release and were maybe a bit luckier. On to the sound itself, the rhythm section is very solid. The vocals are first class and songwriting strong. The production allows for lots of space in the songwriting. Steven Ray Anastos has a good raw emotional voice and guitarist Ronny Jones has good licks to rival the likes of some big bands in delivery without quite the same level of songs. Opener ‘Broken Mirror’, sounds confident with a big groove sound reminiscent of bands like BANG TANGO. This is a great start and continues with “Meantime’ which bristles with promise. There are slower tracks such as “Seven Miles” and closer “Soul of a Child” and the rocking “Celebration”. “Down” is more experimental with spoken word parts and choral backing vocals. “Lay Me Down” is a standout rocker. The other songs are good if not great but the sound is top notch and production as you would expect from Beau Hill who has worked with the likes of WARRANT, ALICE COOPER, EUROPE, RATT and WINGER amongst others. There a lot’s of “lost” bands and great demos that never developed into albums. Great bands who only released one album. BLACK BAMBI fall into the good band almost releases LP on a major label with big producer category. Bit of bad luck there but this release of their 1990 album is well worth visiting and a nice legacy for their music.